"Combining the Knowledge of Analog and Digital Photography." 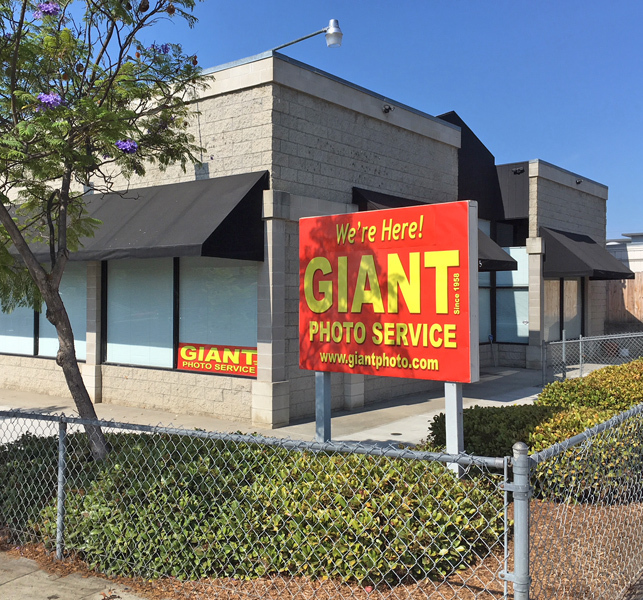 GIANT PHOTO SERVICE is a Custom Photographic Digital Imaging Lab located in San Diego, California, specializing in Custom Enlargements, Mounting, Laminating, High Resolution Scanning, Art Reproduction, Life-size Cutouts, Photo Restoration, and Expert Consultation. Free street parking or free customer parking right behind our building. We are on the corner of El Cajon Blvd. and Harbinson Street. Enter from Harbinson Street. 24" X 36" Color or Black & White inkjet Posters made directly from your snapshots or digital file. Great for parties, special occasions and school projects! Now you can restore and share old family photos! They make great personal gifts for the holidays! These prints are literally "Ready to Hang" on your wall. No expensive frame is needed nor glazing of any type. These prints are printed from your files with pigmented inks for longevity, have a protective laminate for non-glare protection, are mounted on light weight 3/16″ Black Gatorfoam, and have an inexpensive recessed back frame (Gator Frame) to facilitate easy hanging. They look like they are floating about 1/2″ off the wall and can be any size or shape up to 5′ x 10′.